Documentary following the doctors who can now interrupt, and even reverse, the process of death, and the families asked to make the most ethically difficult decision in medicine. Provocative documentary following the doctors who can now interrupt, and even reverse, the process of death. Filmed over six months in the country's leading brain injury unit (Addenbrooke's Hospital, Cambridge), it follows the journey of a man who, by only moving his eyes, is eventually asked if he wants to live or die. Two other families are also plunged into the most ethically difficult decision in modern medicine. Many documentaries, Louis suggests, could do with losing a few minutes here and there. He makes an exception for Between Life and Death though, which doesn't waste a second with its economical storytelling. The day to day events which take place in hospitals have the potential to be highly emotional and full of drama. 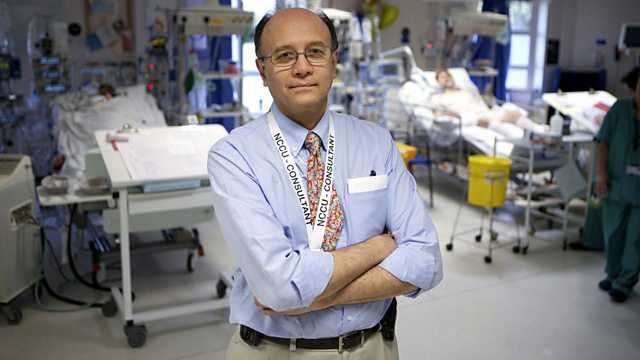 Nick Holt's Cambridge-based film was an inspiration for Louis Theroux's 2014 documentary, Edge of Life, about Los Angeles' famous Cedars-Sinai Medical Centre. In 2011, Between Life and Death won a BAFTA and an RTS Television Award for Best Single Documentary. A collection of programmes exploring the work of Doctors, Nurses and health professionals. Documentaries exploring the technologies promising to build a better world.